An obvious criticism of behaviourism is that it treats humans as a black box, where inputs into the black box, and outputs from the black box, are known and measurable, but what goes on inside the black box is ignored or not considered of interest. However, humans have the ability for conscious thought, decision-making, emotions, and the ability to express ideas through social discourse, all of which are highly significant for learning. Thus we will likely get a better understanding of learning if we try to find out what goes on inside the black box. Thus the search for rules, principles or relationships in processing new information, and the search for meaning and consistency in reconciling new information with previous knowledge, are key concepts in cognitive psychology. Cognitive psychology is concerned with identifying and describing mental processes that affect learning, thinking and behaviour, and the conditions that influence those mental processes. Bloom et al. also argued that there is a hierarchy of learning, meaning that learners need to progress through each of the levels, from remembering through to evaluating/creating. As psychologists delve deeper into each of these cognitive activities to understand the underlying mental processes, it becomes an increasingly reductionist exercise (see Figure 2.4.2 below). Figure 2.4.2 © Faizel Mohidin, UsingMindMaps, 2011. 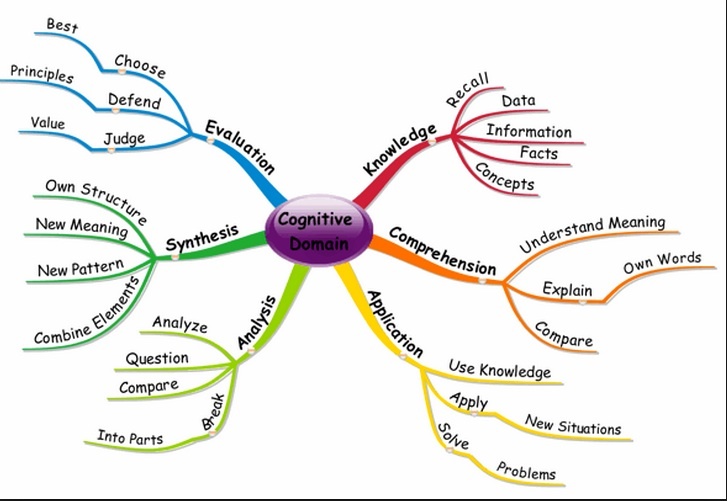 Cognitive approaches to learning, with a focus on comprehension, abstraction, analysis, synthesis, generalization, evaluation, decision-making, problem-solving and creative thinking, seem to fit much better with higher education than behaviourism, but even in school/k-12 education, a cognitivist approach would mean for instance focusing on teaching learners how to learn, on developing stronger or new mental processes for future learning, and on developing deeper and constantly changing understanding of concepts and ideas. 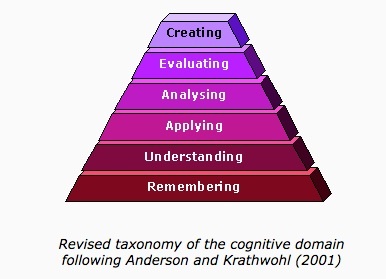 Cognitive approaches to learning cover a very wide range. At the objectivist end, cognitivists consider basic mental processes to be genetic or hard-wired, but can be programmed or modified by external factors, such as new experiences. Early cognitivists in particular were interested in the concept of mind as computer, and more recently brain research has led to a search for linking cognition to the development and reinforcement of neural networks in the brain. instructional design approaches that attempt to manage the design of teaching to ensure successful achievement of pre-determined learning outcomes or objectives. Cognitivists have increased our understanding of how humans process and make sense of new information, how we access, interpret, integrate, process, organize and manage knowledge, and have given us a better understanding of the conditions that affect learners’ mental states. 1. What areas of knowledge do you think would be best ‘taught’ or learned through a cognitivist approach? 2. What areas of knowledge do you think would NOT be appropriately taught through a cognitivist approach? 3. What are your reasons? 2.4 Cognitivism by Anthony William (Tony) Bates is licensed under a Creative Commons Attribution-NonCommercial 4.0 International License, except where otherwise noted.